You Only Get Out Of Life, What you Get Out And Do. We all have had a moment when we are relieved when something hard and fought after is over. But there was only once that the relief was overwhelming, where the completion of the task changed my physical being, an elation that I have only felt once. It wasn’t the completion of any tour or the releasing of the DVDs, but when I caught my last fish to become a Virginia saltwater expert angler. This week, Rob felt that relief. The Expert Angler award is a quest to catch 6 different trophy sized fish within a calendar year. There is no separate class for kayak or shore or boat. The vast majority (I would say 99%) of expert anglers have achieved this by boat. And for the last 7 years, I was the only one who had don’t it all by kayak. 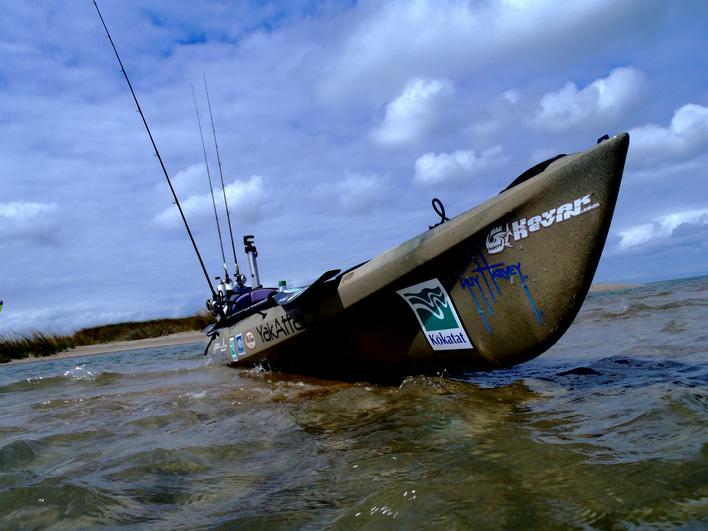 The expert chase is a game of getting enough time on the water, and targeting one fish at a time till you get em. It’s the stress of a tournament, but it goes on for a year. By the time I was on the last one, a minimum 23” taug, I was using vacation days to get out every day I could. I consider the expert chance harder than any of the tours I have done, in this trophy hunting game as a kayaker, there is a greater chance of failure. I was under a huge amount of stress and I live at the fishery. Rob lives in Richmond Va. 100 miles away. Rob had 5 down, striper, speck, shark, sheepshead, and red drum. 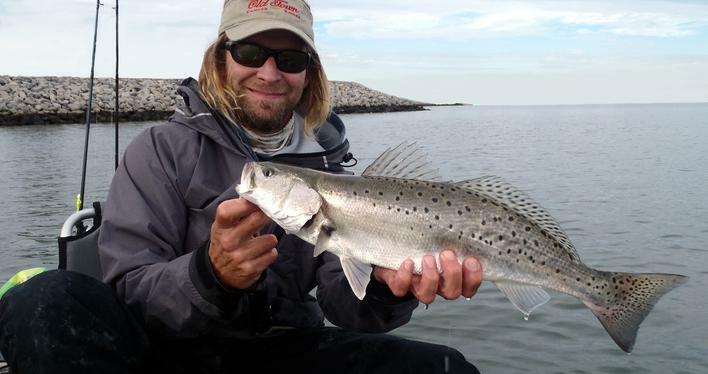 The only one left on the target list that he can get this late in the year was Tautog. And that is one of the toughest trophies for us (kayakers) to get. The tog huntin crew was me, Lee, Alex and Rob. We paddle out to the island and we start picking a few. This was Alex’s first time tog’in and catchin his first togs. We had em biting on the pilings but one seemed to be more active, Alex had some nice ones. Rob and lee where fishing a piling I was intermittently filming. Rob had I nice grab and a miss. He drops back down and hooks into a solid fish. Lee sees the rod bend and pulls his line in and gets out of the way. The fish hits the surface and all of us see this could be the one! He fights the tog right and lands the big tog. We get it on the measuring stick and it is the one. 23” citation tautog, number 6 for robs expert angler. You can say I know how you feel to something’s but in this case, I really know how much this achievement means and what kind of relief it is when it’s over. Personally I couldn’t be happier to share this moment with my good friend and now the second only Kayak Virginia Saltwater Expert Angler, Rob Choi!! Now, who’s up next for the challenge, GET ON”EM!!!! Every year in the fall the specks begin they're migration out of the bay. They hang and feed in some spots along the way, others like my backyard fishery is a a stop and go spot. When I use to tag specks, it seemed like they would be recaptured within a week in the same spot but after that time, they would move on. I don't get excited for specks, I don't like to go chase them all around, but I do spend a week or two when they are passing thru my backyard. My stopin point is when the water temps get low enough to slow the fish down and I have to slow the lure retrieve, that's my attention limit. We had an approaching cold front mid week, fished before and after, before was by far the better day. I paddled out for the high tide, Jay was meet me a bit later. The usual locals were out and the reports were favorable. Spot one was taken, I headed to spot two, jay headed to spot three. I drift cast until i hooked one, a 17"er then anchored and cast. i hook another smaller one then into a solid 21" speck. One of my local boat friends anchored near and we were in the school for a while, landing decent specks every few cast. Jay texts me and said he was catching small specks. I told em i was in em, and i was wondering why he wasn't here yet. The bite ended, my buddy moved on, jay still hadn't shown up. During this lull I varied my retrieve to try to entice and fish around, then I hooked another 21"er with my old faithful steady swimming retrieve. Jay finally paddles over and immediately hooks into a real nice one. With his best speck to date thrashing at the side of the boat, he was trying to boga grip him. I yelled "Get that fish in your boat!" And Jay scoops the 23"er in. And it was a petty one. That night Mark Losier invited me to hit the lit docks of Lynnhaven along with RLee. We paddled up on a good one I stood to get a high angle view. I made a cast and rolled my dark plastic lure un the light and saw a striper swipe at it. I cast again and hook a nice 20"er. All the action seemed to spook any other fish, so we moved to the next light. Losier started to get stripers blow up on his lure, but didn't want to grab it. They didn't like mine so I moved on. I found a bright light but, there was no way to cast in to it. The lifted boat was surrounded by the dock. But I saw a red in the light. I nosed my Old Town Predator under the dock, let about three foot of line and cane polled the lure and whap!! I thumbed the spool and kicked off the dock yanking the 21" red from under the dock. Again no action from any others after fighting one from that dock. I moved on, but came back later. I nosed in the same dock again and snatched a 21" striper from that dock. That was it for us that night, it was later than I thought and we paddled in. A cold front moved in shifted the winds. Lee and i targeted the specks but only caught spike specks. All the while lees saying " so i heard the speck bite here was on fire?" My short speck season is in effect, looking like I will get another shot this week to GET ON,EM!! It has been blowing strong northeast rainy winds literally for a solid week. But the water temps didn’t crash since the winds weren’t really that cold for this season. 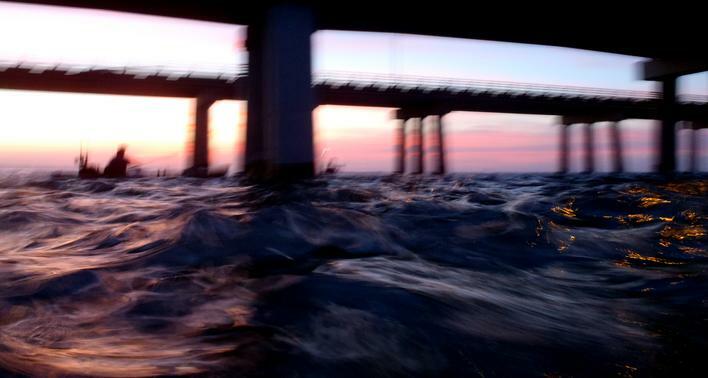 When the weather finally did move on this week, lee, jay and i hit the bridge for an evening tide change to see if any of the big reds were still around. The bait was there but no reds to find them. Dwindling reports from Virginia waters and the good reports from the NC ocean piers, kinda sorta makes me think they moved out of our range. The next fishable day I headed to the eastern shore to do some sightcasting, the reports have been there a little red invasion moving down the shore. As I was driving across the CBBT, I left tan cloudy water on the southside, drove over clear-green water in the middle of the bay. I felt good about sighting fish, then about four miles from the shore I crossed a line of pure mud, and it engulfed the eastern shore peninsula. My sighting day ended before it began. At the launch I overheard commercial clam fishermen talking about how the little reds are in there way feeding while the harvest the clams. I chuckled and launched. I trolled a spoon along marsh grass into a creek and caught the first red of the day. The current was strong outgoing so I didn’t get into the back of the creek, but found a few reds. 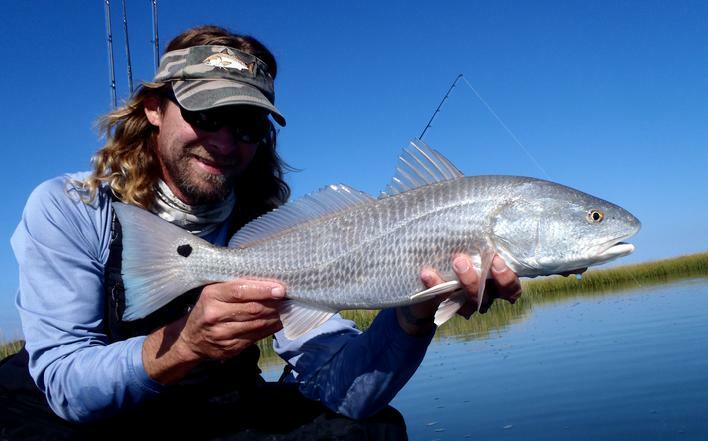 I paddled around looking for some clearer water but settled on standing on a low tide sandbar and cast into a nice little creek choke point and caught a bunch more lil reds. If the big reds are gone for the year, it was the best one I have had, landing 21 big reds (40 plus inchers) this year. Next up are specks, then tog, then striper. But of course I am already looking forward to next spring and the return to GET ON’EM! Back in the school days, when I was playing football the preseason summer practices where done in the early morning and late evening to beat the mid day heat. Two-a-days when fishing is going out for two of the current changes. This week was an extraordinarily unusual calm weather pattern for this time of year, and with seeing one last week I had to full "drum dumb" and go after em all week. The first morning, nothin. I thought I needed to step up my attempts and make it to the 4am slack the next morning. After the afternoon nap I was back out for the evening slack current. I had a croaker down and a croaker on my bait holder. I have a few feet of 30lb mono tied to my kayak. On the end is a swivel and a small hook. I hook the extra baits thru the nose and they hangout till i need em. I was grappled to the piling and my mini rod (bait catching rig) was in the forward rod holder of the ultra 4.7, that was on the bottom and it was slack current. I noticed my live bait line had moved. I thought the current on the bottom had started to move. Then the line moved quickly under my boat and swept back. It grab the rod and the line grabbed the mini rods line and was on the snap swivel of my bait holder. The fish made a hard lunge and my line was cut by the sharp edges. I was shocked but before I freaked out I made cast and bounced the jig around to try to find the school but didn't find em. The current was slack and it was nearly imposable to catch bait until the water started moving. I finally found a pigfish and put him down. Just as the current picked up I felt mu boat tug a little to the side, the rod was bowing up. I grab it from the rod holder and the fight began, luckily he ran away from the bridge and I was able to get on top of em and land the 47"er between the bridges. The relief in making up for losing the first one due to my mistakes was huge. Didn't have anymore action that night. The next mornin I was out with baits down way before sunrise. Fished thru the tide changes and headed home for a nap. Back out for the evening slack, Richey Bekolay came out. We fished thru the turnaround and I was about ready to start headin in. I felt a thump. I look at my line and its moving away. I say "here we go" and calmly pick up the rod, thumb the spool and come tight! The fish starts to run and I turn my nose and pick up speed. As I gather my line i accelerate to a speed that Bekolay said "I couldn't keep up!" This red didn't do and of the usual cut backs, just a fast straight line. Toward the end of the minute long run he had come up to the top, then he turned toward the pilings but I had em to close to get away. At the end of the fight I noticed a wound on its belly. I landed the 49"er and examined the spot. To me it looked like a shark attack. It looked over a week old but it was still a long way from being healed, and it smelled like meat that was about to turn rank. It looked bad but the fish was healthy, ate a bluefish, fought well and released strong. Bekolay and I paddled back to the bridge but no more runs that night. The third day I hit for the morning slack, nothin, then meet Ric Burnley for the evening slack but nothin for us that night. The last mornin I skipped the early slack and Erin came with me on the evening run. She caught her first kayak caught fish, a black sea bass then continued to catch croaker, spot and an oystertoad. As we where catching bait I saw a triggerfish feeding on the piling with his back out of the water. I paddled to him got a few seconds of footage and then had to try to catch em. All I had to use to possible hook em was my mini rod that is set up for catching bait. It has a small hook and fishbites bloodworm as bait. I inched beside him the whole time sure I was gona spook him and he would disappear. I got the bait beside him and I saw him turn on it. I feel that he has it and I set the hook. Luckily he ran away from the piling, I loosened my drag and fought the big 17 "er to my boat. I was excited to catch one of the biggest triggers I ever caught and to catch em by sighting. We didn't have any red action but we had a fun evening on the water. On Saturday after a 14 hour day at work I had my last opportunity to get out before a week long blow approaches. I had baits in the water an hour after leaving work but no action that evening. I was lucky to have the weather to get out this week, especially since there is a big weather change in store for next week. I don't know how it will effect the fish, but i'm pretty sure there will be an effect after this next strong fall cold font moves in. But ill find out the next time I get an opportunity to GET ON'EM!! For the last two years we have had big reds at the cbbt. 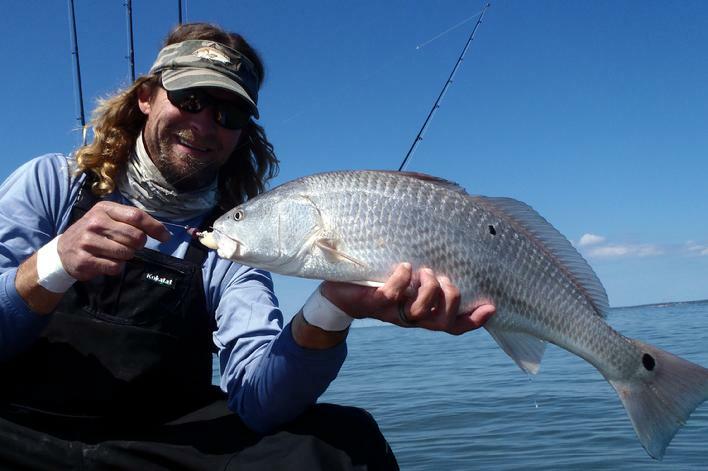 two things i wanted to do this week is one; prove that we can catch reds at the CBBT this time of year. the first year could have been a fluke, the second could just have been a once in a while pattern, but a third year would make it an anual thing. For the last two years we have already caught them by this past week. But like the rest of the conditions this year, its all been a little off. The second thing was hope the weather hasent changed their route. I had great conditions for three of my four days off, and i took full advantage to get out. 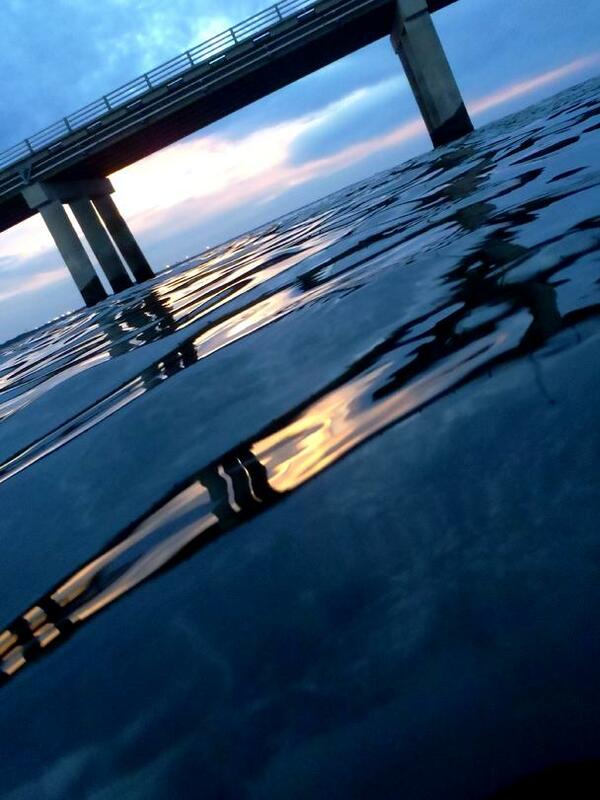 The water clarity at the beginning of the week was a little dingy. On the first night lee, rob and i couldn't catch any bait, the wind was choppin up the water so we didn't hang out there for to long. The next day i found some bait but no runs and no grabs on the artificials. That evening Damien came out. Damien hasn't gotten to fish with us much this year while hes been dealin with truck problems. But in true Damien fashion, he comes out and hits a home run. Bait was hard to find. My first catch was a 13-14" croaker, i put him down saying to damien. "A 50"er will eat this one"
In 2008 and 09 we had phenomenal years for 20 -28 inch class reds. We would hunt schools of in the shallow flats all day long. Then those grew up and joined up with the big guys. In those years we had a lull in that slot red drum size, i think due to a generation gap when maybe they didn’t have a good spawning year. During the past few years we had plenty of 12"ers, then the next year 16-18"ers. Now this year, that year class has grown into the high 20" range. Rewind to days before.....back on the main target, big reds. Lee, Rob Choi and I headed to the bridge. We paddled out at dusk, the water was choppy, the wind was irritating, the smell of the algae (VA red tide) was in the air, the water clarity was dingy, and the bait was not there. We didn’t stay to long. Few evenings later I headed out and had the same results. The next morning i was ready to do it again. I was running late, then went ahead and changed my plan all together. I got back home, changed out my big fish gear for my lil fish gear and headed for the E-shore. 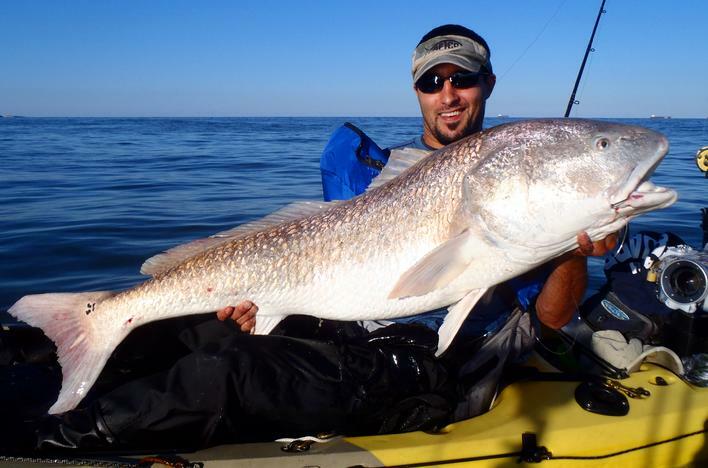 Ever since 2008 when we ran into the slot size reds and began to active sight fish that area. I always have sighting lil red as my primary target this time of year. But with the generation gap, the past few years have been slow for the lil red action. I launched, the current was coming in, and I headed into a creek. Started casting and started catchin. Baby specks where at the bottom of every hole. 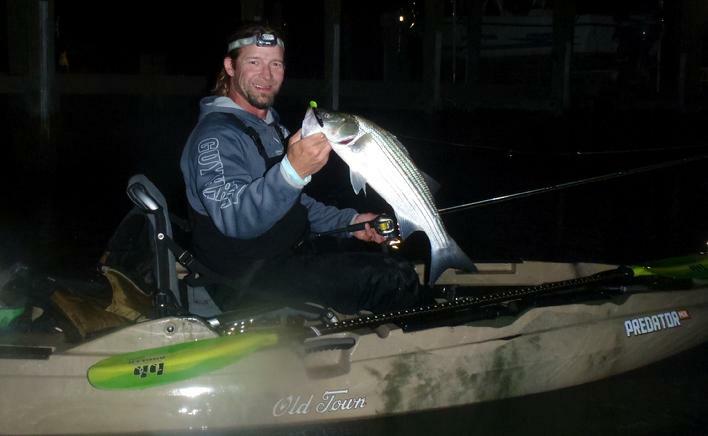 Baby stripers where striking at small bait on top and baby flounder where fixed on the ledges. I took the tide into the back, I saw a wake being pushed, and I knew that wasn’t mullet. I set myself up across the creek as I closed in on them; it was a school of 10 or so, they where following the leader. I made a cast across their path and waited till the right time to twitch it. I saw the leader turn and I reeled two more turns real quick and my first red of the day grabbed it. After release that first one, my day continued, finding schools and picking one or two out of them, even three in a row out of one school. One of the great things about this fishery is that it is constantly changing, species and sizes change year after year, but it’s all cyclical and seems to always come back around, some faster than others, and some right on time even when you might need a good day. Sightcasting to one fish is a good for me, being able to pick on em all day long, thats a great day for me. 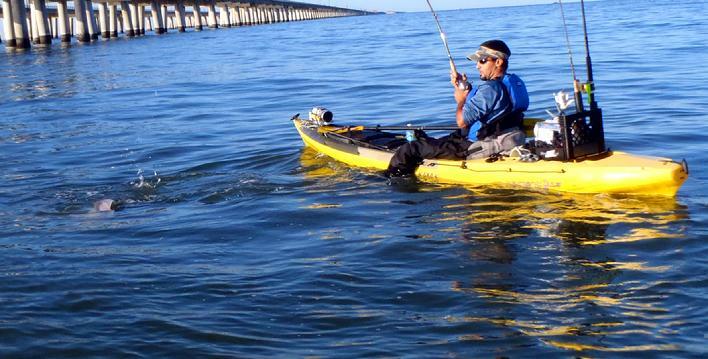 if i have to, I will paddle just to see one fish and have my shot to see em and GET ON’EM! © Copyright 2006-2013 Kayakkevin.com Productions. All rights reserved.